This Friday (November 16) the Rolling Stones will release the live package Voodoo Lounge Uncut. 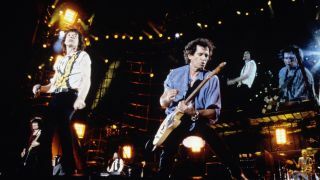 The concert was filmed and recorded during the band’s set at the Joe Robbie Stadium in Miami, Florida, in 1994 as the Stones toured in support of that year’s Voodoo Lounge album. It’ll launch on DVD, Blu-ray, DVD/2CD, Blu-ray/2CD, 3LP, 3LP coloured vinyl, digital video and digital audio this week, with a HD digital audio to follow. Now the band have released a trailer for the release, which features guest appearances from Sheryl Crow, Robert Cray and Bo Diddley. Check it out below. A statement reads: “Voodoo Lounge Uncut presents for the first time the full, unedited show filmed on November 25, 1994, at Miami’s Joe Robbie Stadium. “Originally directed by the legendary David Mallet, this new version features 10 performances omitted from its previous release in the 90s, and the full show is now presented in its original running order. “With its ahead-of-its-time cyberworld staging, guest appearances from Sheryl Crow, Robert Cray and Bo Diddley, and a setlist combining classic tracks with – then – new material from the Voodoo Lounge album, this phenomenal show can now be enjoyed as originally intended. Find full details on the release below.